The local elementary school, named after Emanuel Lasker, is the only public school in Germany which teaches chess as part of the curriculum, and it had done so since 1823; just as the Ströbeck secondary school, which was closed in 2004, due to too few pupils. 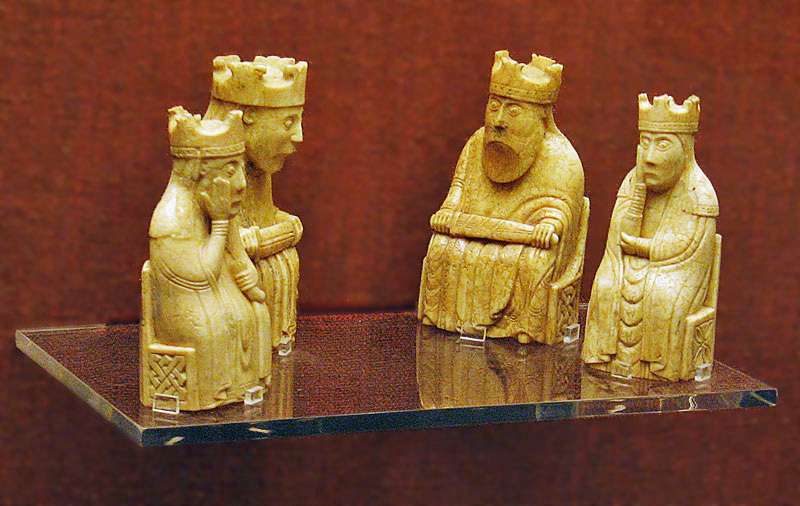 The Lewis chessmen (Norwegian: Lewisbrikkene; Scottish Gaelic: Fir-Tàilisg; Scots: Lewis chesmen) or Uig chessmen, named after the bay where they were found, are a group of distinctive 12th-century chess pieces, along with other gaming pieces, most of which are carved from walrus ivory. Discovered in 1831 on Lewis in the Outer Hebrides, Scotland, they may constitute some of the few complete, surviving medieval chess sets, although it is not clear if a set as originally made can be assembled from the pieces. When found, the hoard contained 93 artifacts: 78 chess pieces, 14 tablemen and one belt buckle. Today, 82 pieces are owned and usually exhibited by the British Museum in London, and the remaining 11 are at the National Museum of Scotland in Edinburgh.